Third quarter came to a close last week, followed by Middle and Upper School advisor conferences this week. Lower School conferences are scheduled for April 16. I hope your child is having a successful year, and if there are ever any questions, please don’t hesitate to reach out to your student’s advisor or teacher. I look forward to the fourth quarter and a strong finish to the year. NYA thespians have already been busy this year with two performances. The Lower School students presented The Lion King KIDS in the fall, and Middle and Upper School drama presented Joseph and the Amazing Technicolor Dreamcoat this winter. The fifth graders are currently working on a production of The Phantom Tollbooth. The performance will be held on May 2 in the Higgins black box theatre. Congratulations to all the students involved in these productions as well as Mrs. Krainis and Mrs. Vaillancourt for their great work. Upper School students’ artwork is on display now at Clayton’s until April 26. This exhibit illustrates the wide range of disciplines and techniques explored in the NYA Upper School Art Studio. These disciplines include drawing, oil painting, screen printing, and independent study. Student experience ranges from beginning to advanced placement. Students are prepared by first learning to use the fundamentals of art through classical methods, and as they move up through the levels of each discipline, they are encouraged to use their strong fundamentals to create unique compositions and tackle challenging subject matter. Contributing artists include: Samantha Babbitt ‘22 , Jack Nice ’21, Jack Lent ’19, Lexi Haedrich ‘21, Sydney Billings ’20, Naomi Reischmann ’21, Nicole Pappas ’20, Malia Morin ‘20, Justin Demeule ‘22, Finn Murray ‘19, Maya Davis ’20, Taylor Hemenway ’21, Abram Buehner ’19, Abby King ‘22, Marion Robbins ‘19, Salem Griswold ’21, Alaina Rauf ’21, Quinn Hunold ’21, James Tourigny ’22, Bryce Poulin ’22, Tallulah Im ’22, Ellie Griswold ’19, and Helen Hamblett ’19. Come check out the show! Congratulations to Natalie Farrell ’21, Maggie Holt ’22, and Lauren Powers ’22 for their selection to the 2018-19 Maine All-Prep Ice Hockey Team. The Maine All-Prep Team was selected by coaches and Athletic Directors of the four schools in Maine that play NEPSAC girls hockey. The schools include: Berwick Academy, Hebron Academy, Kents Hill School, and North Yarmouth Academy. The Maine All-Prep Team consists of six forwards, four defense, and two goalies. Congratulations to the NYA girls hockey team on a great season, and to Natalie, Maggie and Lauren on this honor! Key Clubs across Maine are working together to gather supplies for the Preble Street Shelter in Maine. NYA’s Key Club is collecting shelter supplies including backpacks, towels, duffle bags, laundry detergent, etc. There will be collection boxes in the Main Office in the Upper School as well as the front entrance of the Middle School. If you have any of these items, or if you would like to make a cash donation for us to buy these items, the Key Club would appreciate it! Thank you to Alex Markonish ’19 and all of our members of Key Club. Congratulations to our March Break Reading Challenge winners! This was a record year with 50 entries. The judges had a difficult time choosing from the many entries, but ultimately the prizes went to Peter Sillin (faculty and staff), Sydney Billings (Upper School), Nathanael Wayashe and Campbell Jacobs (Middle School), and Grady Richard (Lower School). Thank you to everyone who participated. All the photos will be up on our Flickr feed very soon! You are cordially invited to the NYA Soirée on Friday, April 26, 2019 at Halo at the Point, Thompson’s Point. This will be a fun evening of camaraderie and support for NYA, including games and prizes, auction, dinner, a hosted bar and live music by Wavelength! Learn more and RSVP at www.nya.org/soiree. I hope to see you there! Mad Science of Maine is offering Radical Robotics for students in kindergarten through fifth grade beginning on Tuesday, April 9. Register online at www.madscience.org by Tuesday, April 2. 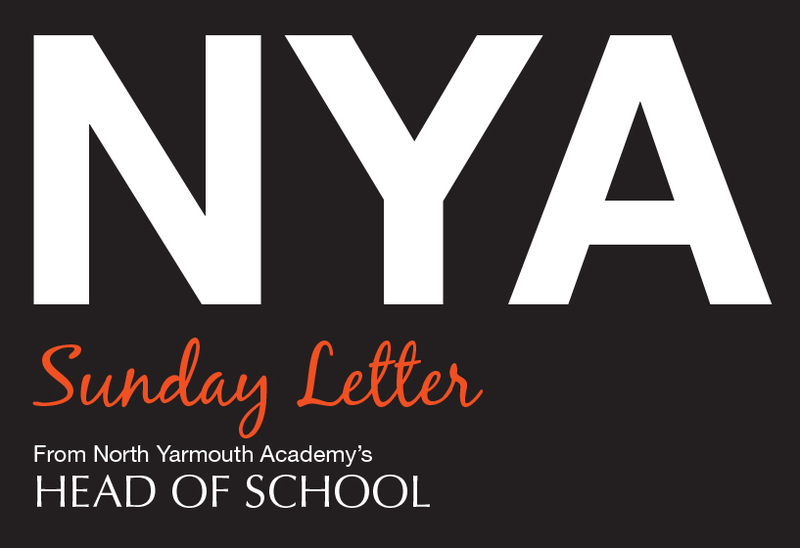 Looking ahead: NYA will be closed Monday, April 15 in observance of Patriots Day. The Academy will also be closed on Tuesday, April 16 (Lower School conferences and faculty in-service).